As I sit here in rehab with my newly sober shakey hands just finishing Glennons Love Warrior in one night all I can think is thank freakin' god. My heart fills my whole chest but does not hurt. I let her look right at me and she is not mad. She and I are the same. She loves me, I know it. She has been waiting for me. I sit in front of her and she is what I needed, she is the hiding place Iv been looking for. She is not mad. Glennon is my Mary. She is my red velvet carpet. She is my candle of prayers not my bottle of wisky. Amen! A-freakin-men. Glennon carries her pain and the pain of others with such GRIT and GRACE and then lays it out bear and hands us the most precious gift she has to give. This book is all the things we are desperately too afraid to say, it's all the ugly truths and scariest words spoken for us, she does not fluff or sprinkle the glitter over a single word, she is brave and sensitive and honest and vulnerable and scared and joyful, she is courageous, she is the canary and the warrior and the sister all rolled into one. She doesn't turn away, she is with us and we are with her, we wont turn away. Me too. Me too. Me too. We are all the same. This book is pain sneakingly heart wrenching, it is not for the weak willed, it takes courage just to read it and stay with it and allow it to take hold of you and change you all up inside, it will break your heart open but you won't want to put it back together again, you'll know your heart is better broken open and wonder why ever did you strive for an unbroken heart before. This isnt a book about pretty glossy pain, this book is raw and an ugly beautiful claw yourself out of your own skin pain. Read this book, be gentle with yourselves and with her, watch her carefully, learn from her, she knows things we don't yet know and she's sharing them with us. She is women's saving grace, we belong to her, there is no judgement there, she's right alongside us and she's holding our hands. Let's be careful with her and her book and hold her hand right back. .
Beautiful review, Becca. I know that you are a canary and a warrior, too, and you can do this hard thing. I'm holding you and your canary heart in mine. Powerfully said. I'm moved just by the review this book inspired from you. Wishing you all the best on your road of recovery. Keep fighting, sister. It's so worth it. Facing this life sober is terrifying and harsh some days, but the joy and happiness are real. Remember- just focus on the next right thing. I wish you strength and love in your fight. You are worth it. You took my breath, and made me even more grateful for this book. Great review! Let us know how you're doing! Wow, amazing review. You def made me want to read it even more. I'm so glad the book held such a special place for you. I wish your continue success in your journey. Keep going! 6 years sober here. Much love. You obviously have a great talent for writing. I think you sold many copies of this book. You're the reason I'm going to read this book. It's a daily struggle, but life is beautiful. WOW! If you haven't written a book, you should! Beautiful review full of raw emotion. I first heard of this book yesterday while watching Dr Oz and wanted to read some reviews and an excerpt before purchasing for a dear friend of mine. I'm now going to also purchase a copy for myself, my daughter and another couple of friends. This review should really be sent to the author to see. Becca, you are a fabulous writer and you could not have said it better. I totally agree with your review. I too loved it. We are all the same. YES!YES! Mindy wrote: "Your review took my breath away--- powerful breath taking account of Glennons book. God bless you and your journey ! Feel like we should be sisters ;)"
Becca - I want to read YOUR story - if you are ever ready to share. Your words are remarkable - strong - honest - I hope you are doing well. I hope you write YOUR story precious one. We heal others through our story. Love it!!! And keep going!!! Absolutely beautiful review!!! I love how you express yourself so beautifully and powerfully. 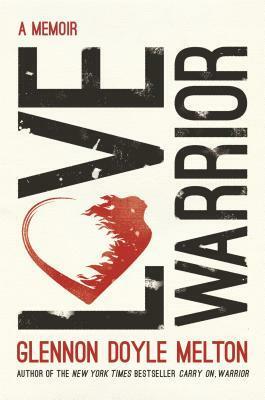 You are a love warrior! Becca, your review takes my breath away! Sorry, but this reads EXACTLY as if Glennon wrote it. The words, the cadence, the composition. Where is Becca now? One book read, one review. Something odd about this. do you have any idea how beautiful your writing is? it moved me more then the book itself. Amazing! Thank you for that. I loved her other book Carry on Warrior also, you rock Becca! Hope you are taking it one day at a time and continuing to love yourself. nothing odd, kimberly boone, dont tend to write reviews and dont use good reads, but i made the effort for this book because it was everything to me. Emilerose, thank you, you're so lovely to say that, thank you. Thank you, Becca! I hope you are still doing well after sixteen (or so) months! In ten days, barring disaster, I'm due to receive a coin embossed with a Roman numeral VI. And yet—here I am, grateful. Grateful for a husband and two daughters who stuck by me in spite of ME. Grateful for scads of new friends in recovery. Grateful for sanity. I DO miss financial stability but three out of four ain't bad. Thanks to a random stranger on Goodreads for your beautiful review. I wish you all the best, one day at a time. PERFECT REVIEW! I've lent my copy to my mother, my mother-in-law, my sister and my best friend and we all felt exactly the same way. I just found this book slightly depressing and tedious. I was just glad when I finished it. I know this is out of sync with most of the reviews but it is how I feel about the book. I was disappointed.